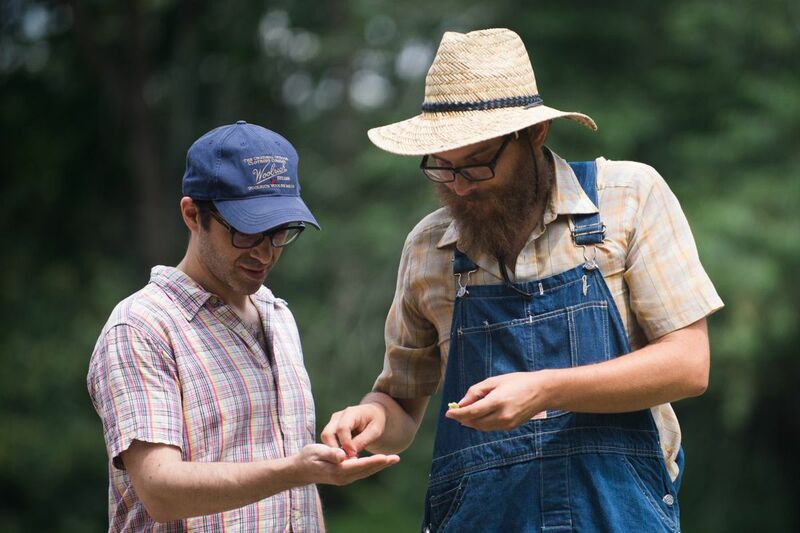 ‘Farmer Nate’ Kleinman shows William Levin (left) seeds at one of the fields of the Alliance Colony ‘reboot’ in , Pittsgrove, NJ. Nate Kleinman, aka "Farmer Nate," stands straw-hatted under the fierce sun at an experimental growing field in Salem County. The unexceptional-looking expanse of sandy soil lies in the heart of America's first Jewish agricultural settlement, a hamlet just off Route 55 near Vineland that Russian immigrants fleeing persecution founded as the Alliance Colony in 1882. More recently, William and Malya Levin, a Brooklyn couple with New Jersey roots and big dreams, have begun to nurture 50 acres along Gershal Avenue in Pittsgrove Township back to productive life. Kleinman seeded two of those acres last spring with a variety of sample crops to figure out what will grow best there. "That little plant is a Guadalupe cucumber," says Kleinman, as the Levins, a group of Allegheny College students and their religious studies professor, several other visitors, and I fruitlessly fan ourselves in the midday heat. "There are Saudi Arabian okra and Cuban tomatoes," Kleinman adds, with a delightful, and contagious, relish. "See that plant that looks like a little corn plant? That's the sorghum, from South Sudan." William and Malya Levin at the homestead of the Alliance Colony “reboot” in Pittsgrove, N.J. The house belonged to his grandparents. Sorghum, spelt, and tartary buckwheat are among the heritage grains expected to become mainstays of the nonprofit Alliance Community Reboot, or ACRe. The Levins conceived the project in 2014. Last Sunday, the couple, who have spent about $500,000 to acquire property mostly from family members, hired Kleinman and his business partner, Dusty Hinz, to start clearing and cultivating the fields. "There's a huge unmet demand for heritage grains, for gluten-free grains," says Kleinman, 35, whose deep regard for sorghum is such that his business card features an image of its deep red seed-head against a blue sky. He and Hinz have been farming in nearby Elmer for more than three years. The two men also are the founders of Philadelphia's Experimental Farm Network; it encourages online collaboration among plant breeders, researchers, and others involved in sustainable, community-supported agriculture, farm-to-table, food sovereignty, and similar grassroots initiatives. I join the group for brunch in a Gershal Avenue house once owned by William Levin's grandparents. About a dozen of us share a feast of salads, bagels and a smoked fish platter imported directly from Brooklyn; the talk around the table is all about the possibilities of the project. "Jewish farming is not just touchy-feely hippie B.S.," says William, a 45-year-old animator who grew up in Vineland. His great-grandfather Moses Bayuk was a member of one of the 43 original Alliance families. "Farming is a way to create a meaningful, modern-day community," says Malya, 33, ACRe's chief counsel and the mother of the couple's 21-month-old son, Samuel. "There's a global movement around agriculture as an expression of Jewish values." Locally, the Jewish Farm School "is incredibly excited about the possibility of a larger-scale Jewish community farm less than an hour from our base in West Philadelphia," says Nati Passow, executive director of the nonprofit educational program. "William and Malya are tied into the contemporary movement, and, through their land and family history, they have the potential to build much stronger bridges between past and present," he says. The past is still very much in evidence: In June, Ruth Bogutz, of Cherry Hill, helped organize a bus tour of a half-dozen historical Jewish farming communities in South Jersey, including Alliance, Woodbine, and Rosenhayn. About 35 people took the trip. There were Jewish farming colonies all over the world, and many of them were in the United States, Bogutz says. "Alliance was the oldest, and the ones that lasted the longest were in South Jersey." In the late 19th century, Jews fleeing Russia, many of them urban professionals or merchants, arrived in the United States under the auspices of charitable organizations seeking to save them from annihilation. "They escaped the worst possible life imaginable, and they came here, not knowing how to farm," says Jay H. Greenblatt, a Vineland lawyer who helped establish the Alliance Colony Foundation, and is a descendant of those pioneers. The immigrants were assisted by nearby farmers, some of them Quakers. They lived in tents at first and ate in a communal kitchen, eventually building a cluster of tiny villages, including Alliance, Norma, and Brotmanville. “Farmer Nate” Kleinman shows William Levin and his wife, Malya, test crops growing in an experimental field in Pittsgrove, N.J., where the couple seek to re-establish Jewish agriculture. Within a generation or two, many of the settlers' children had moved on; one of the synagogues was sold to a Christian congregation. The reboot project "is fantastic," says Howard Jaffe, 62, of Pittsgrove. The unofficial caretaker of what is commonly called the Alliance Synagogue, a beautifully restored Gershal Avenue landmark, Jaffe is one of three Jewish farmers still active in the area. "And now there's also Nate, of course," he adds. A Philly native who got into agriculture through the Occupy and other progressive movements, Kleinman says he's "happy to be part of writing the next chapter in the history of the Alliance community and Jewish farming in South Jersey." Leaving the experimental field, I'm chatting with William Levin when he spots a grapevine that was winding up into the trees at the edge of the cultivated area. "When I was a kid, I came here with my dad, who died last year," he says. "We picked grapes together." Kleinman tastes a green grape, says it's most likely a Concord variety, and describes it as "super-resilient." Rather like Alliance may turn out to be.